Made famous by Mr. "I Pity the Fool" T, the '80's TV show is getting a remake ala Dukes of Hazard last year. 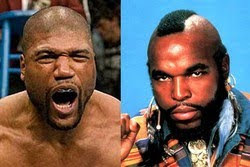 The casting of Quinton "Rampage" Jackson of UFC fame has caused quite an uproar in UFC circles with critics deriding his decision to play the role of Mr. T's character Sgt. B.A." Baracas as way of ducking a second consecutive scheduled fight. In addition to Jackson a couple of other noteworthy names make up the cast including Liam Neeson and Jessica Biel. You can get a first look of Jessica on set here and the full cast here. 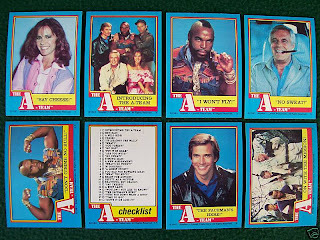 Seemingly with all TV shows in the 70's and '90's Topps made a trading card set. Complete 66 card sets and 12 sticker sets can be found for less than $10 on eBay. Jessica Biel is certainly an attractive woman but she is no Jessica Simpson. So if cheesy '80's TV shows are the next norm for Hollywood I suggest just keeping in cheesy and not try to make it to dramatic by casting legitimate actors and actresses like Biel and Neesom. 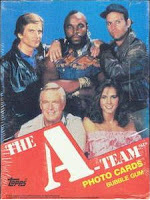 The A-Team defines the 1980s. They are currently making a movie. Not sure why they bother.